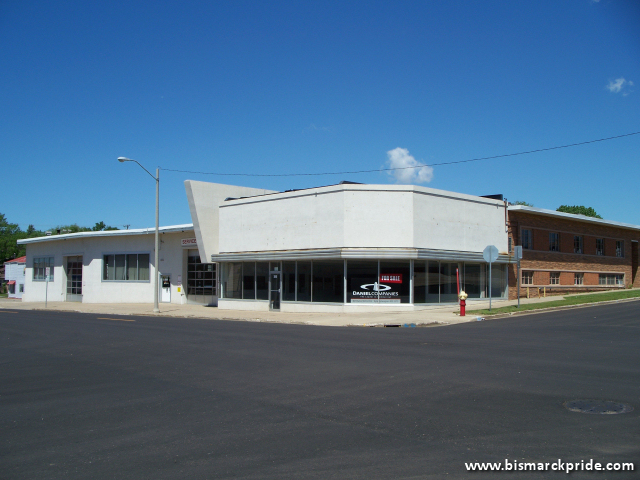 Building originally housed long-time local dealership Fleck Motors and most recently Wilhelm’s Buick-Oldsmobile-Cadillac. Front section of the building was constructed in 1952; however, the rear section is much older – I believe the 1930s. Fleck’s Motors was once one of the largest dealerships in North Dakota. Their garage on Main Avenue was the site of a major winter fire in 1977, destroying an entire city block. They were in business for over 60 years. Wilhelm’s opened its Bismarck dealership in 1986, and closed in 2007 as a result of a GM reorganization. Schwan GM Auto Center assumed franchise rights to the Buick and Cadillac names. Wilhelm’s still operates its dealership in Jamestown, North Dakota. Today, the site is home to Broadway Centre, a mixed-use facility.